(Beyond Pesticides, December 21, 2017) On December 18, the U.S. Environmental Protection Agency (EPA) declared that glyphosate is likely not carcinogenic. Relatedly, after weeks of stalemate on a decision by European countries, the European Union (EU) voted, in late November, to extend the license for the herbicide for another five years, despite massive opposition in member countries. In the U.S., the Center for Biological Diversity charged that the EPA assessment relied heavily on industry studies to arrive it its conclusion, and ignored its own guidelines for assessing cancer risks. Senior scientist at the Center for Biological Diversity Nathan Donley said, “The only way the EPA could conclude that glyphosate poses no significant risks to human health was to analyze industry studies and ignore its own guidelines when estimating cancer risk. . . . The EPA’s biased assessment falls short of the most basic standards of independent research and fails to give Americans an accurate picture of the risks posed by glyphosate use.” Glyphosate is due for its EPA registration review in 2019, and opponents are concerned that the December 18 announcement portends likely re-registration — which advocates say is bad news for human health and the environment. 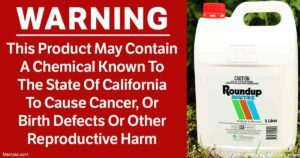 As the chief ingredient in Monsanto’s pervasive herbicide, Roundup, the compound has historically been touted by industry and the EPA as a “low toxicity” chemical and “safer” than other compounds. Glyphosate is widely used in food production, on lawns and playing fields, and in parks and gardens. The EPA pronouncement conflicts with the 2015 classification of glyphosate as a “probable carcinogen” by the World Health Organization’s International Agency for Research on Cancer (IARC). It also contravenes a ruling by California’s Office of Environmental Health Hazard Assessment, which included the chemical on its Proposition 65 list of “probable carcinogens” in July 2017. The California decision is commonly considered to have been spurred by the IARC action. In its report, IARC noted that glyphosate has been linked to DNA and chromosome damage in human cells. Epidemiologic studies have found that exposure to glyphosate is significantly associated with an increased risk of non-Hodgkin’s lymphoma. Indeed, it was later revealed that EFSA copied dozens of pages from a Monsanto study in reaching its conclusion that glyphosate is unlikely to pose a cancer hazard to people. (EFSA’s recommendation was supposed to have provided independent analysis for European Union member states.) In what was likely a recognition of the corrupting influence of industry, in October 2017 the European Parliament (EP) banned Monsanto lobbyists from access to committee meetings, digital resources, and contact with any EP members. More than 250 lawsuits are pending against Monsanto in U.S. District Court in San Francisco, brought by people who claim that Roundup exposure caused them or a family member to contract non-Hodgkin lymphoma — a cancer that originates in the lymphatic system, which comprises much of the body’s immune system, and can then spread throughout the body — and that Monsanto covered up the health risks associated with glyphosate. The first trial is set for June 18, 2018 in San Francisco County Superior Court. The EPA announcement represents yet another hurdle for scientists and advocates, who have worked for years to have use of the toxic pesticide banned or severely curtailed. Among the critiques of the evaluations of glyphosate is that they often assay the compound per se, rather than in formulated glyphosate products, such as Roundup. It is these formulated products — which have inert ingredients that increase their overall toxicity — that are typically applied to crop fields, gardens, and landscapes. Glyphosate (N-phosphono-methyl glycine) is a broad spectrum, post-emergent, non-selective, systemic herbicide used on non-cropland as well as a variety of crops. It has seen the largest use in crops that are genetically engineered to be tolerant to it, where it kills most grassy and broadleaved plants. Glyphosate products, such as Monsanto’s Roundup, are formulated with surfactants and other ingredients to increase its effectiveness. Glyphosate blocks the activity of the enzyme 5-enolpyruvylshikimate-3-phosphate synthase (EPSPS), a key enzyme in the shikimate pathway of production of aromatic amino acids. Since this pathway does not occur in animals, safety claims ignore glyphosate’s adverse effect on beneficial bacteria essential to human health. Newer scientific studies have also looked in greater depth at glyphosate’s mode of action and the implications for human and ecological health. Glyphosate works by disrupting a crucial pathway for manufacturing aromatic amino acids in plants—but not animals—and, therefore, many have assumed that it does not harm humans. Patented as an antibiotic, it blocks the activity of the enzyme 5-enolpyruvylshikimate-3-phosphate synthase (EPSPS), a key enzyme in the shikimate pathway of production of aromatic amino acids.However, many bacteria do use the shikimate pathway, and 90 percent of the cells in a human body are bacteria. The destruction of beneficial microbiota in the human gut (and elsewhere in and on the human body) is, therefore, a cause for concern—and a major contributor to disease. In addition, the destruction of soil microbiota leads to unhealthy agricultural systems with an increasing dependence on agricultural chemicals. Assessing the mode of action of glyphosate, scientists have found that it starves and sickens the very crop plants that it is supposed to protect. It is dangerous to base the review of chemicals on the assumption that microbiota is irrelevant to assessing dangers. While it is well known that taking a course of antibiotics disturbs microbes that help digest food, disturbing the microbiota has greater consequences than a bout of diarrhea. It can contribute to a whole host of “21st century diseases,” including diabetes, obesity, food allergies, heart disease, antibioticresistant infections, cancer, asthma, autism, irritable bowel syndrome, multiple sclerosis, rheumatoid arthritis, celiac disease, inflammatory bowel disease, and more. For more information this, see Monsanto’s Roundup (Glyphosate) Exposed. As evidence of the hazardous effects of glyphosate mounts, Beyond Pesticides urges communities around the U.S. to advocate for the elimination of glyphosate and other toxic pesticide use, at least in public spaces. Consumers can have a real impact by talking to neighbors, farmers, and the legislators who make decisions that affect people’s health. As always, contact Beyond Pesticides at [email protected] or 1.202.543.5450 for assistance, or visit the Beyond Pesticides website. Meanwhile, as the regulatory wrestling continues, the best ways to avoid glyphosate and other harmful pesticides are to support organic practices in agriculture and for lawns and landscapes in the community, and to purchase organic food. This entry was posted on Thursday, December 21st, 2017 at 12:00 am	and is filed under Cancer, Environmental Protection Agency (EPA), Glyphosate, Monsanto, Uncategorized. You can follow any responses to this entry through the RSS 2.0 feed. You can skip to the end and leave a response. Pinging is currently not allowed.